← Blow to Low Carb Diet as Landmark Study Finds High Fiber Cuts Heart Disease Risk- But It Matters Where the Fiber Comes From! Using a large bowl, whisk together the egg whites and 2 Tablespoons arrowroot until frothy. Place the chicken in the bowl and coat with the egg mixture. Allow the chicken to sit and soak up the mixture for about 5 minutes. Warm a nonstick large skillet on the stove. Place the orange juice, soy sauce, sugar, vinegar, sesame oil, salt, crushed pepper, garlic and ginger into the pan. Whisk together and heat until boiling. Turn the temperature down to low; cover, and allow the sauce to simmer for 3 or 4 minutes. Combine the water and remaining arrowroot in a mixing bowl, and stir until the arrowroot is dissolved. Stir with the whisk as you slowly add the water to the sauce. You may add more water, such as 2 to 3 tablespoons, if the sauce becomes too thick for your liking. In a large skillet, heat the vegetable oil. Add the chicken to the oil in small batches. Stir the chicken around the pan with a wooden spoon for 3 to 4 minutes, so that it cooks evenly. Drain the cooked chicken on clean paper towels. Once all of the chicken is cooked, toss it in the sauce until it is well coated. Garnish with toasted sesame seeds and sliced green onion. 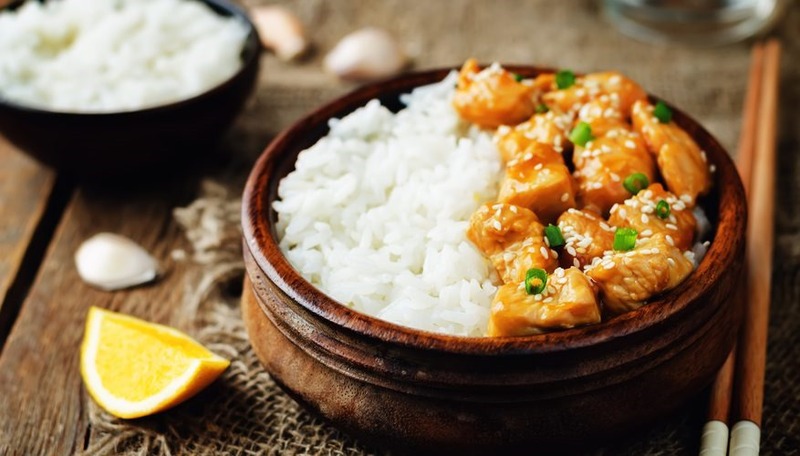 Orange chicken is traditionally served over white rice, but you may substitute sides as you like. Some pairing suggestions include sautéed spinach, steamed broccoli, rice noodles and vegetable spring rolls.